Before starting The Goblins of Bellwater I fully admit to thinking it was going to be a story of David Bowie-eqsue goblins and young maidens trying to rescue their siblings. While this novel did have a rescue element, an old curse, and goblins. They were definitely not the swoony Bowie kind. They were the traditional, gross, obsessed with gold type. The Goblins of Bellwater takes place in the fictional town of Bellwater located in Washington state along the Puget Sound. I grew up in Tacoma so the setting and feel of a rainy pacific northwest winter felt very familiar. The descriptions were well done and left me feeling a little homesick. The main storyline revolved around Kit, Livy, Skye and Grady. It dealt with how their lives were affected by the goblins living in Bellwater and the curse on Kit's family. There was also a great deal of romance in this story. I'd say the main thrust of the first part of the novel was setting up the romances between Kit/Livy and Skye/Grady. If I had one main qualm with this novel it would be that the romance read a little young to me, more young adult than new adult which is how I would classify this book. I liked the pairings but there was a lot of fade to black type scenes. I enjoyed the environmental elements of this story. A large part of novel takes place in the woods and waterways of Puget Sound. This is an area of great beauty and the story touches on issues of the human impact on the local environment. Livy is a forest ranger of some sort and I liked that aspect of her character. 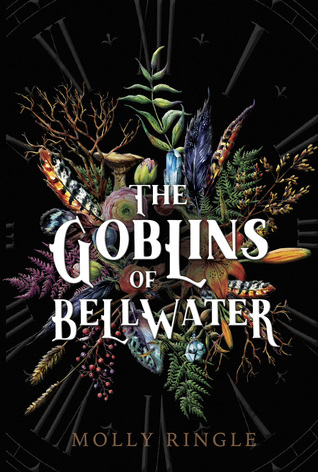 Overall, I enjoyed The Goblins of Bellwater. I've been in a pretty serious book slump for the better part of a year now. This book had that something interesting that made me want to keep reading. It's definitely one to add to your TBR list.